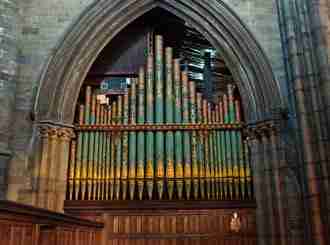 In 1997, Mander Organs (then under the name N P Mander Ltd.) was commissioned by the PCC of Doncaster Parish Church to undertake a feasibility study of the restoration of the Schulze organ at Doncaster Parish Church. The study was funded by the Heritage Lottery Fund, which was considering providing funding for a full restoration of the instrument. The restoration did not go ahead, in the end, and since then the report has been gathering dust in our archives. Very generously, the Vicar and Churchwardens, supported by the PCC, have given us permission to make this important study (probably the most comprehensive of the Doncaster organ and Schulze in general) more generally available. We are pleased to be able to do this and thank those at Doncaster Parish Church for allowing us to do so. The report was written by our then head designer, Geoff McMahon.